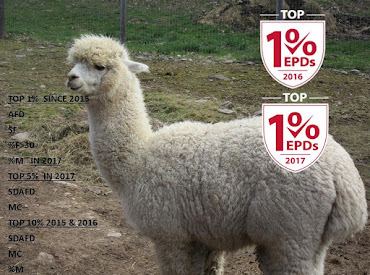 Gladiola is the product of our two original cria from the first two bred alpacas that we started our farm with in 2011. 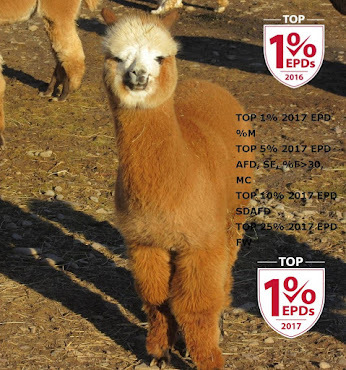 We expected this pairing to bring an outstanding cria and it did! 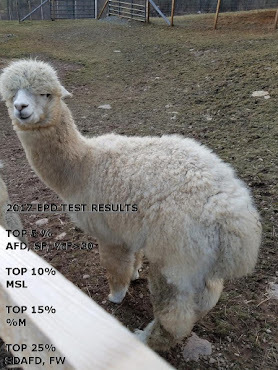 Gladiola is a fantastic medium fawn girl like her mother; she is a very big girl with over 13lbs of fleece weight when shorn in 2018. Her fiber is crimpy, long and very dense; currently at age 3 her micron was 21.9. Her first EPD Test results in 2016 placed her in the Top 1% for FW, the Top 10% for %F>30, MC and %M and the Top 15% for AFD, SDAFD and SF. 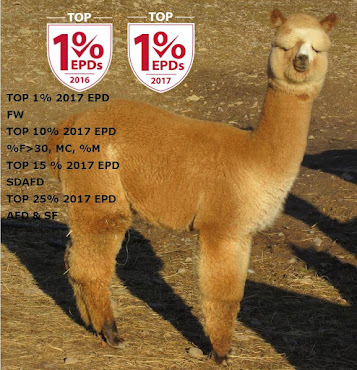 Her results for 2017 placed her in the Top 1% for FW, 10% for %F>30, MC, %M, Top 15% for SDAFD and the Top 25% for AFD & SF. 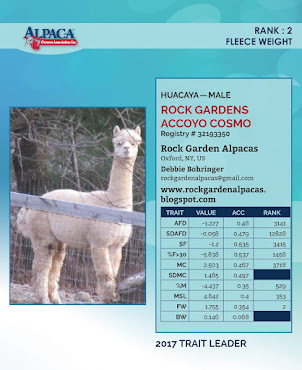 Her dam is our Rock Garden Perucoyo Zinnia, a sweet beautiful, medium fawn multiple ribbon winning alpaca with a very rare bloodline and fleece that is extremely fine and uniform throughout. 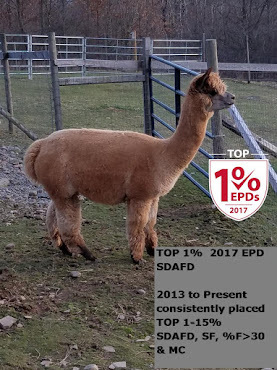 Zinnia has consistently placed in the Top 1 - 15% since 2013 for the traits of SDAFD, SF, %F>30, MC, and SDMC. Zinnia's dam is our girl Ivy (Gianna's Peruvian Ivy), whose genetics are also extremely rare. 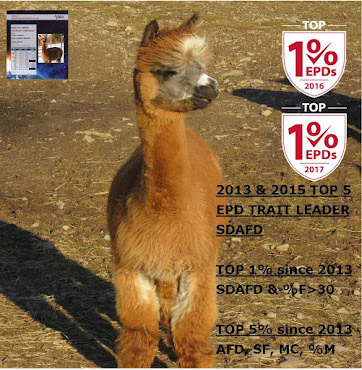 Ivy was a Top 5 EPD Trait Leader in 2013 and 2015 for the trait SDAFD and missed by one in 2014; was #6. Gladiola's sire is our herdsire, Rock Gardens Accoyo Cosmo who has once again been named one of AOA's Top 5 EPD Trait Leaders for 2017 in fleece weight and will be featured in their presentation during the Alpaca Owners Association National Show and Auction in 2018; this is his third year in a row. 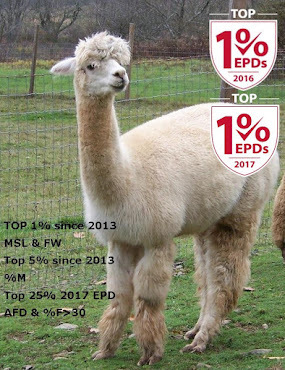 He has consistently been in the Top 1-15% for AFD, SF, %F>30, and %M, MSL & FW since 2013. Cosmo's dam is our girl Alpavo's Accoyo Sunflower Girl who also has extremely impressive genetics. "Glady" would be a great addition to your herd!